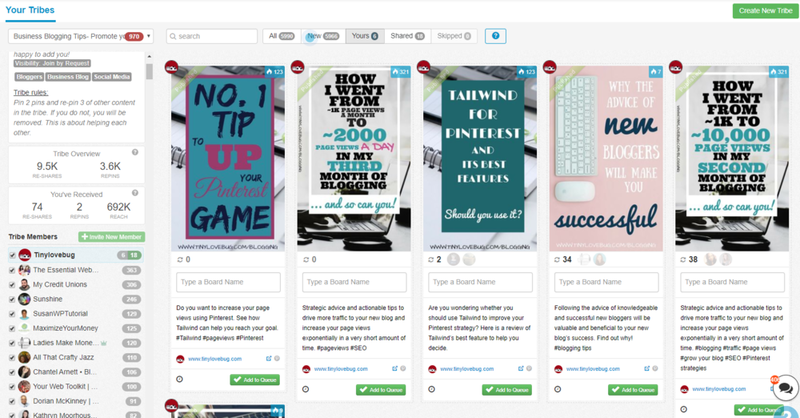 All right, so Tailwind is a scheduler for Pinterest which makes pinning easier and helps you grow your blog traffic. But more than that, Tailwind is my new best friend! No kidding, it has made my life so much easier, I have fallen in love with it. 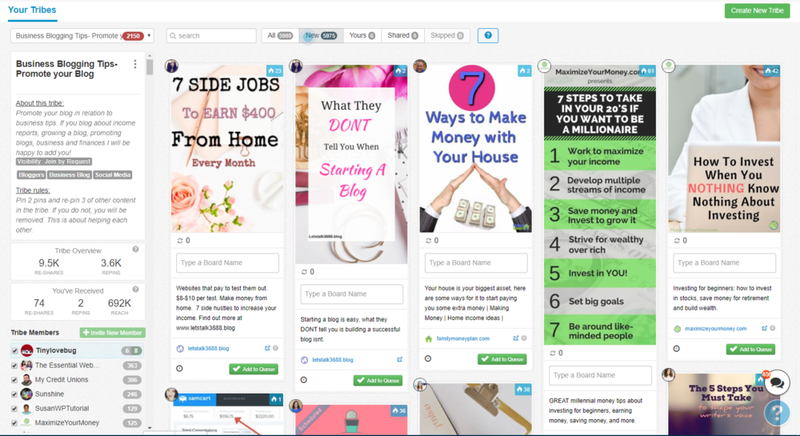 And it has also helped me grow my Pinterest monthly views. To learn more about Tailwind and understand how to use it to your advantage, you can read my declaration of love to Tailwind. If you just want to try it with no commitment, you can subscribe for a free trial here. But now, seriously, let me tell you why Tailwind Tribes are the best thing ever! 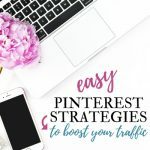 Any decent post about Pinterest strategies will tell you that you need to get your pins out there. Good advice, but wait… how do you do that? Are you benefitting from your Tribes? Yep, they’re good, really good. But they’re also very hard to reach. First, you need to find a board, keep your fingers crossed that they’re open for contribution, then you have to work out how to apply and then wait patiently for the board’s owner to go through all requests. If you’re one of the selected ones to participate on the board, you’ll need to learn the rules and keep track of all the pins that you pin on them (you don’t want to look spammy). If you would like to contribute to our boards join our facebook group. Tailwind Tribes are community boards created within Tailwind. In other words, they’re a great place to share your pins for others to re-pin, and where to find high traffic content for you to re-pin. Tailwind has recently implemented a searching tool for tribes within the platform. Can you see those three little men? Yep, they’re a Tribe. On the top left you will find the “find a tribe feature”. Once you click on it a search window will open up and you will be able to look for tribes by keywords or categories, or if you already know the name of the tribe that you would like to join you can look for it. After you type in a keyword a list of tribes will appear. You can see for each tribe some basic information such as name, description and rules. You can also see the number of members and the activity of the tribe. 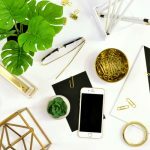 If it’s true that a bigger tribe gives you more content to choose from and a bigger audience for your pins, it’s also true that in a smaller tribe your content is more likely to be chosen for re-pinning. On the right side of the tribe summary you can see if you are already a member of the tribe. Tribes can be public and if so, the only thing you need to do is to click on “join tribe” and you are in. In my case it asks for a PowerUp as I’m already member of more than 10 tribes (we will talk about this later). Some of the tribes are on request only. This means that you have to ask to join and then, if the owner of the tribe thinks that you are a good fit for their tribe they will approve your request. You can have a maximum of 5 pending requests and Tailwind keeps the count for you. 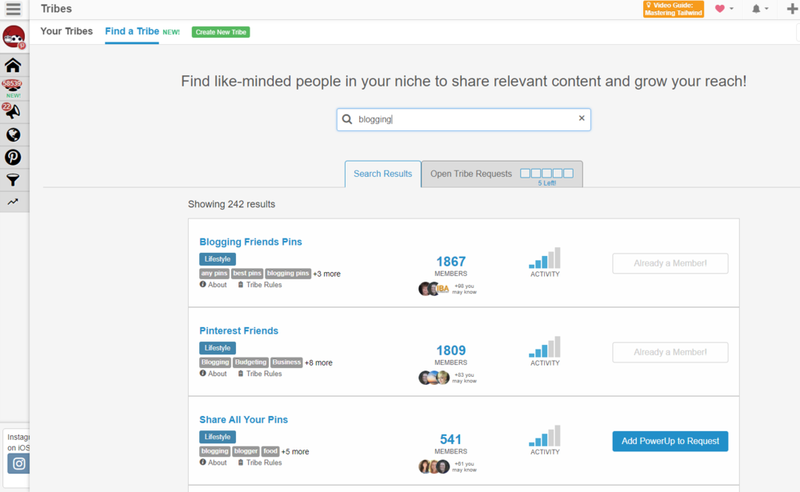 Join only Tribes related to your niche. Remember that your goal is to get your pins out there. 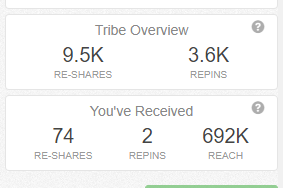 If you add a recipe in a fashion Tribe, I’m pretty positive that you’ll achieve a re-pin rate close to zero. 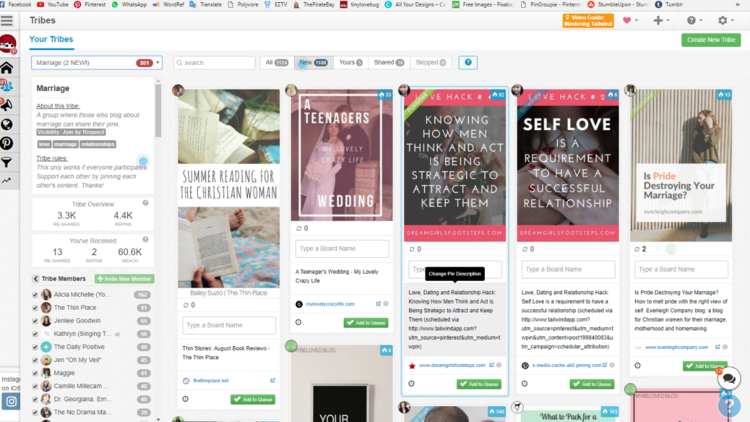 When choosing your Tribes, keep in mind that you’ll need to share pins from other members so try to stay as close to the topics of your boards as possible. Go on the tribe section and you will see all your Tribes. This is a screenshot of one of the Tribes that I’ve joined. If you want to change which Tribe you want to look at, you can use the dropdown menu in the upper left corner. It’s really important that you follow the rules, or the Tribe owner may kick you out. You can find the rules on the left sidebar within each Tribe. Usually, Tribes work with a ratio of 1:1. This means that for each pin you add to the Tribe you should share one. 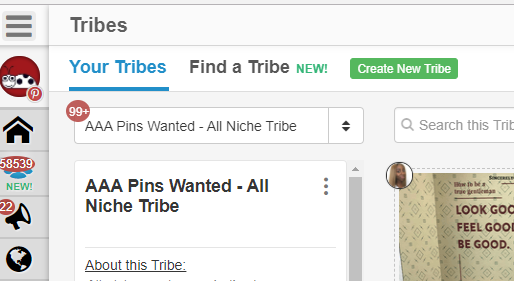 As you can see in the screenshot there is a toolbar that lets you know how many pins you’ve added to the Tribe and how many you’ve shared. In this case, I added 6 of my own pins and re-pinned 18 pins from this Tribe to my board. 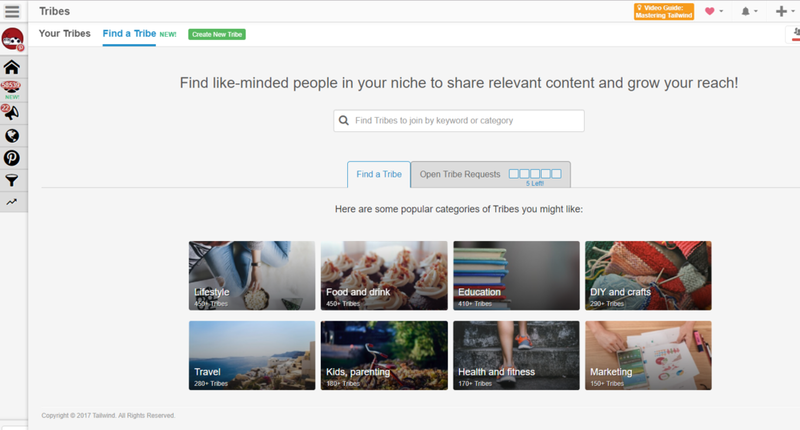 The easiest thing to do is using the search tool in this tribe feature. Skipped – Here are all the pins that you have skipped (you can skip pins that you know you won’t schedule to make your stream less cluttered. I never do it, I feel bad for the author of the pin, even though I know they can’t see I’ve skipped. Yes, I’m crazy). If you trust certain members of the Tribe and you know that their content is good, you can also screen pins by author by clicking on the name of the member on the left side of the Tribe. In doing so, you will only see pins added by that member. Firstly, before scheduling anything, I check that the URL linked to the pin is working and takes me to a real website. You can do this by clicking the URL link below the pin. In the right upper corner of the pin there is a little icon with a number. That number indicates the number of times that pin has been shared on social media. If you click on it, you will see the shares for each social media site. Below the pin you can also see how many and which one of your tribemates have scheduled that pin. When you’re choosing the pins to schedule from the Tribes you want to be careful to not pin the same things multiple times. Tailwind will track pins for you. As you can see in the screenshot (or at least I hope so) in the left corner of some pins there are some tags. The green one says “Published” that means that you’ve already pinned that pin on one of your boards. The blue one says “Scheduled” which means that that pin is already in your queue to be pinned. You’re still able to pin them again, but I would try to avoid re-pinning the same things. Perfect, you know how to choose the content, but how do you schedule it? If you’ve subscribed to Tailwind (if you’ve not you can subscribe here), the easiest way is to write the name of the board where it says “type a board name” (dumb!). 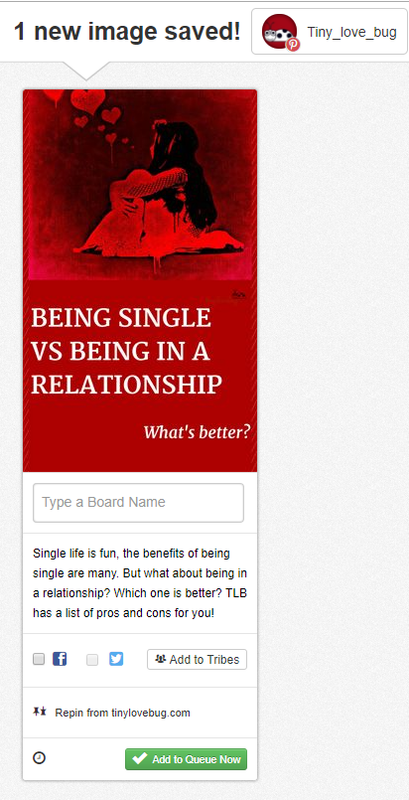 You can also type multiple board names or the name of one of your list boards. To learn more about this you can read how to use Tailwind. 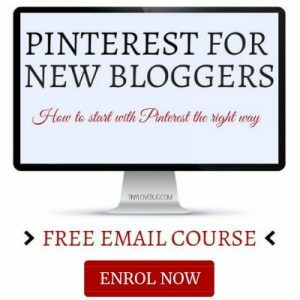 Through this course, you will understand how Pinterest works and how to get the best from it. 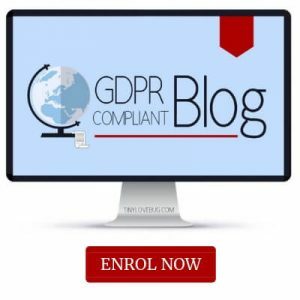 Enrol now – it’s FREE! 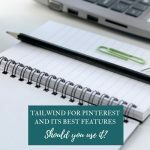 If you aren’t using Tailwind as a scheduler you’ll need to follow the URL below the pin and then you can pin from the source directly to Pinterest. Now you know everything about how to share other people’s content. Great! but your priority is for your pins to reach as many people as possible, right? Sure! So, add your pins to Tribes. This is easy peasy. Do what you usually do when you want to schedule a pin (you can learn how to schedule a pin here). And if you have not subscribed to Tailwind, don’t worry, you can still add pins to Tribes by following the same process. When you have the pin in Tailwind just click on add to Tribe. A list of all your Tribes will open. You can flag all the Tribes to which you want to add the pin. To make your life easier, my best friend (AKA Tailwind) will show you your ratio for every Tribe and if you’ve already added that pin to a specific Tribe. How can you not fall in love with it? Yes, you should try it for free here. At any moment, you’re able to check what your tribes are doing for you. On the left side of the tribe, you’ll find your history. 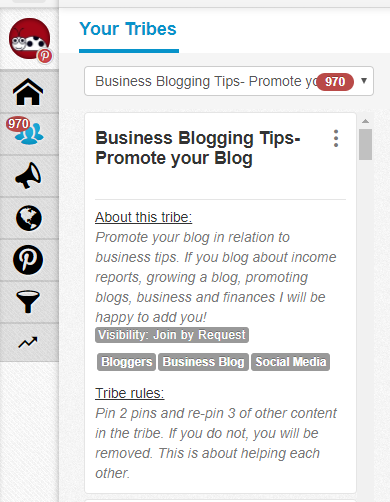 I added 6 pins to this Tribe which have been re-shared on Pinterest 74 times and re-pinned twice. 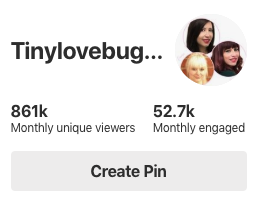 My pins have had 60.6K impression. 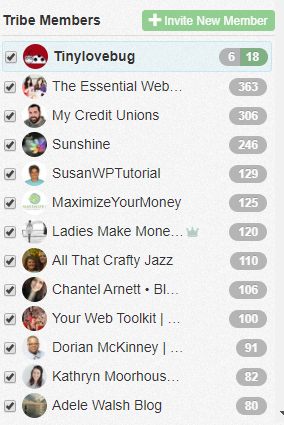 74 times other members of the Tribe have decided to pin my content to one of their boards. From those 74 pins, 2 random people, that probably don’t even know about the Tribe, have re-pinned to their own boards. While my pins were doing all that, they’ve reached around 692K people. If I want to go deeper and check out which of my 6 pins has performed better, I can click on “yours” and Tailwind will only show the pins I’ve added to that Tribe and how many times each one has been shared. As you can see from the screenshot our pin “how I went from 1k to 10.000 page views in my second month of blogging… and so can you” has been shared 38 times (update: at this stage, in our third month, we have almost 2000 page views a DAY ???? and no need to say, Tailwind has helped A LOT). From this, I can also see what kind of content is more appealing to my audience. Sometimes you may want to leave a Tribe, maybe because you didn’t read the “about section” before joining, maybe because the invitation didn’t specify the niche, or maybe that Tribe just isn’t working for you. In this case, find your name on the list of members scroll on it with the mouse and a little menu will open. This is your escape route. Good news, tribes are free, but Tailwind has thought also of power users and created some PowerUps. The FREE plan includes access to 5 tribes and 30 submissions a month. (you can sign up here to get started). The PRO PowerUp includes access to 10 tribes and 80 submissions a month. The MAX PowerUp includes unlimited access to tribes and 200 submissions a month. The ELITE PowerUp includes unlimited access to tribes and 400 submissions a month. The UNLIMITED PowerUp includes unlimited access to tribes and unlimited submissions a month. I think the free plan is a good start as it allows you to share 6 pieces of content a month for each tribe but you have to be careful on picking the right tribes for you as you can only join 5. If you joined tribe before they went public on 1 November 2017 Tailwind has grandfathered you! If at this point you haven’t subscribed for Tailwind, you’re missing out. Tailwind has lots of really useful features. 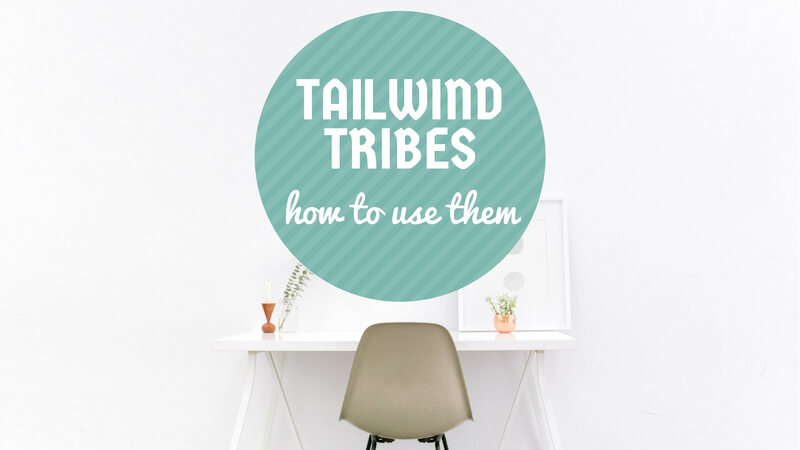 My advice is to implement Tailwind Tribes in your Pinterest strategy as soon as you can. 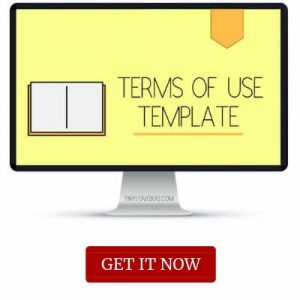 They are a great tool to boost your traffic. 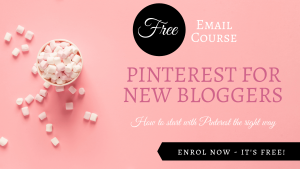 If you are new to Pinterest Check out my FREE course Pinterest for New Bloggers to get started with Pinterest the right way. This is what I have learned so far about Tailwind Tribes since starting using them about 5 weeks ago. If you know of any other features, please let us know in the comments. 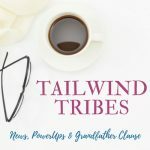 Get started with Tailwind Tribes by joining our Facebook group. See you on Pinterest. Never knew there was a free version of Tailwinds!! Once I get my Pinterest set up and have more articles and pins, I’ll join the team and get started. Thanks or the awesome information! I didn’t know there was a free version of Tailwinds. Thanks for all the info! Just getting my head around Pinterest so this helps. Good advice about bigger tribes vs smaller tribes. I’ve reached my limit of 5 and before I use a power up, I think I will experiment with comparing which boards are doing the most for my pins and try to join a smaller one that will reach more people. 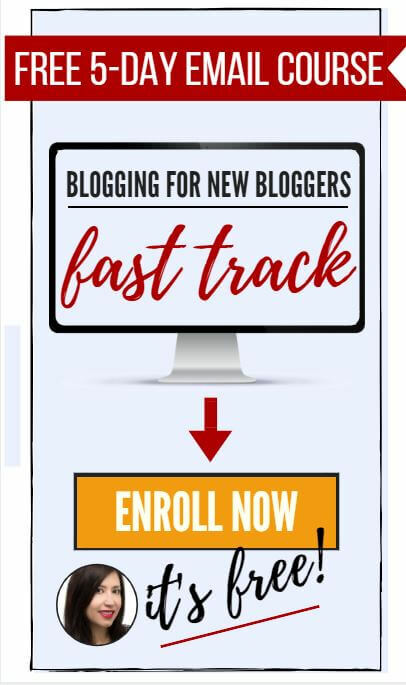 Am yet to employ Tailwind Tribes in my blog promotion, but from this article, am convinced that it is a great way to drive traffic to your blog. Thanks. Most of my blog traffic comes from Pinterest. After I joined Tailwind, my views tripled. It can be a daunting task to get started and navigate Tailwind’s site at first. This article is so detailed and helpful! Thanks! This is a great article for Tailwind. I’m trying to learn it now and this will help me so much. My only problem is that it’s not in the app and I do everything on my smartphone. Do you have suggestions? Thank you! This is exactly what I need! Tailwind confuse me! Thank you so much for this great information. I will read this again time and again. It helps me. Great info! 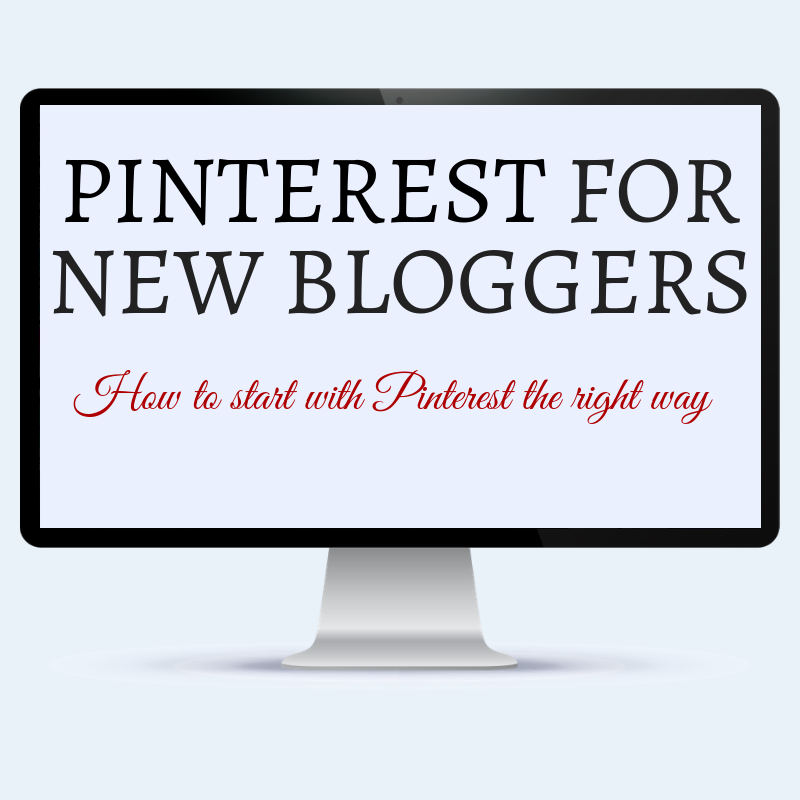 I haven’t tried Tailwind yet but am looking for ways to boost my Pinterest traffic! But tailwind cost money right? Great tips! 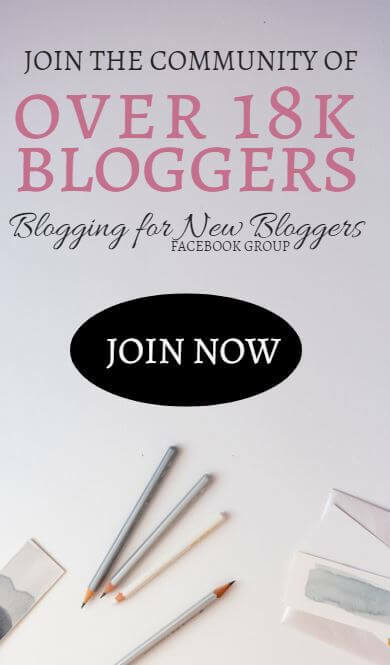 I just joined and was feeling totally overwhelmed! Thank you for a detailed and informative article! I enjoy Tribes but always found the interface confusing, so I appreciate your in-depth explanation. And yes, I like Tribes much better than groups; I always get more shares and also find more interesting articles and a greater variety of articles. Thanks for sharing this – it’s super helpful. One mistake I regularly made at the start with Tribes was posting the same pin at the same time across all of my boards. I purchased the Tribes Max PowerUp, which gave me access to an unlimited number of Tribes, so this became something I did quite regularly. I’ve since started pinning the same pin to no more than 3-4 Tribes per day, and I’m happy to say that this has led to quite a big jump in the number of reshares I now receive. I’d advise any of your readers to resist the temptation of sharing everything in one go, as a lot of Tribes across particular niches tend to have the same followers anyway, so it just ends up being a waste of time.